Effective communication and team building ideas are available for leaders seeking to engage employees for improved performance. 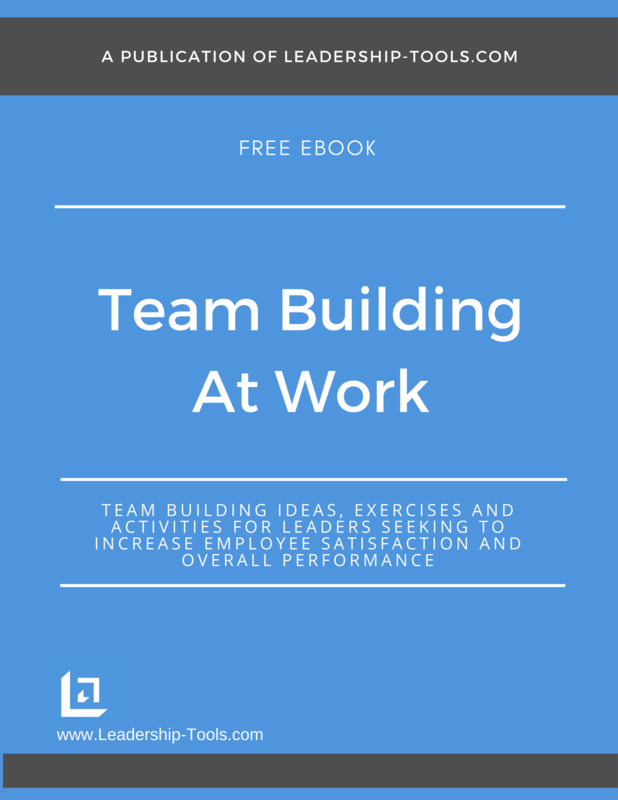 Our Team Building At Work guide is available for free download and covers a variety of topics. In this chapter we focus on effective communication among team members. When your team is not performing to the standards that you expect, ask yourself how effectively you are communicating to your team. As a leader, are you an effective communicator? Although it would be great if everyone saw the world in the same way you do, but the fact is that everyone is different and tends to view the world through a slightly different lens. As a result, the leader needs to ensure that he or she is communicating to each employee in a way that works for that individual. In the end, the ultimate responsibility for non-performance falls directly on the shoulders of the leader. Therefore, it’s imperative that leaders understand the importance of consistent and effective communication. Following are communication and team building ideas to help with this challenge. But first, let's discuss some basic best practices that you can use to improve communication with your team. If you have direct reports who also manage people, this information is great for your next one-on-one coaching session. Observe More, Never Assume - you can learn a great deal in how an employee will either react (negatively, emotionally or impulsively,) or respond (thoughtfully and professionally) to a situation by observing how they interact and communicate with other team members, customers, and business partners. Ask for Direction - while observing employees in action is a great way to get some initial ideas on how employees prefer to communicate, nothing takes the place of a direct discussion and simply asking the employee his or her preference. Use open-ended questions such as, “Help me understand...”, or “Can you please explain to me...”, or “Am I correct in thinking...”, etc. Supportive Yet Firm - it’s important to learn as you go when coaching each employee to maximize their level of performance. Open communication is key to ensuring that you are able to make steady progress. There will no doubt be times when you need to counsel an employee because he or she is not meeting your expectations. When communicating to employees it’s critical that you always maintain a healthy balance in your message. "Leaders need to continually assess whether or not the team has it’s priorities in place and is spending its resources wisely." Balancing your message simply means that while you may need to be firm in setting your expectations, you also want to make certain the employee knows that you are committed to their success and that he or she has your support. Your comments should always be focused on specific performance or behavioral issues that you’ve identified. Always keep it strictly professional, never personal. In order to keep the team at the top of their game, many leaders have adopted the leadership strategy of “subtle pressure, relentlessly applied” - it works, after all, isn't that how mountains are physically moved? Our communication and team building ideas will assist you by encouraging clear and concise discussions with your employees. While some degree of feeling pressure on the job is healthy - especially in a quick-paced, ever-changing, competitive working environment – leaders should never lose sight of the fact that people can become overwhelmed if the leader isn’t an effective filter for the team.This is an area where a leader can truly support the team. To the level you can effectively filter what is passed down to your employees, the better chance they have of remaining focused on your top level priorities. Now let's take a look at our communication and team building activities that will help you in your quest to more effectively communicate with your team members. Purpose: To promote relationship building and communication by providing workplace-friendly shows that can help to connect team members. Explanation: Have you ever arrived early to a meeting and noticed that no one is really talking to one another? Maybe they're quickly saying hello as they grab a cup of coffee but then soon retreat to find a place to sit, but they aren't truly engaged in conversation. Leaders can utilize the pre-meeting time to their advantage by implementing one of these ice breaker ideas. Simply utilize a DVD player and a television or projector. Place the TV at the front of the room and provide a movie or show that might have a theme that is related to the topics of your meeting. For example, let’s assume your meeting is focused on the topic of Change. Choose a movie or show that you believe might help begin a discussion about how change has always been a part of any successful organization. You can make the point that the events of the present-day require us to continually take ownership of leading our team through changing times. The show can be something as simple as one of those old Dean Martin variety shows, or Bob Hope, or Johnny Carson, or a concert performance from the Rat Pack. You could play an old Saturday Night Live show or an old Steve Martin movie. Anything from the past that has evolved over time and appeals to the mass market can be effective communication and team building topics. Use these shows to spark discussion on how one of the performers or actors from long ago has had to change and evolve in his or her career in order to grow and expand their skills and thus increase their opportunity. These old shows are fun to watch, and they will no doubt bring back fun memories for your team members. The laughter that is heard will liven up the atmosphere of the room and help to wake folks up and prepare them for a fun and engaging team meeting. Purpose: Use this communication and team building exercise to teach team members that they can often control their outcome by how they choose to see the world. How they choose to communicate their feelings and opinions to others is an important lesson in this communication and team building activity. Explanation: In general, people tend to either react negatively or respond positively to any given situation. Reacting is usually out of habit and comes from a lack of self awareness or insight on how one can better respond. Use the definitions below to spark discussion among your team as to how they communicate and go about identifying issues and solving problems. Leaders can use the following definitions as a leader's guide, but try to get your team to come up with the definitions themselves. The Victim - this person is the complainer, the blamer, the attacker, who sees the glass always half empty, it’s always someone else's fault. He believes that someone is always out to get him. He has no hope for a brighter tomorrow and he puts himself first and is quick to overreact to any given situation. The Passenger - this person remains neutral. He makes every attempt not be noticed, flies under the radar and is careful not to make waves or call attention to himself. He appears satisfied on the outside but may very well be talking trash behind everyone else’s back. Depending on the situation and who he is talking to he may respond positively or react negatively. The passenger goes through life simply as an order-taker. He let’s the world happen around him and waits for circumstances to happen to him. The Leader - this person has developed an instinct to thoughtfully respond to situations. He or she makes every effort to hold his or herself fully accountable for the events taking place in his or her life. A leader expects things to work out to his advantage. He believes in himself and his team members. He knows there is a solution for every problem. He is a free thinker and doesn’t allow others to determine his path. A leader puts others first, because he knows that by doing this his team will respect him and make every effort to ensure the team is successful. Make the key point... our outlook determines our outcome. Now that you’ve placed your team in the proper emotional state, it's the perfect time to ask them an important question. Ask your team members to get out a sheet of paper and list every single thing about their job that they like and appreciate. The list will quickly grow as people begin to focus their thoughts on what they’d miss if they didn’t work for your organization. "Unless you remind people, they are quick to forget the many benefits and opportunities that come from being fully employed." For example, they would miss out on receiving a steady income; retirement/401k; heating and air conditioned workplace, benefits; co-workers/business associates; career development and training; short commute; free parking; challenging work; and the list goes on and on. Once the lists are completed, go around the room and ask people to share. Write a master list on a flipchart to capture all of the many benefits people have identified. 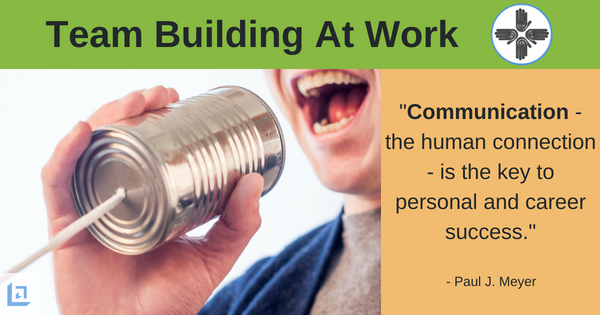 Completing this exercise is a great way to communicate and remind your people of all the good things in life as well as all the great things going on in the workplace. For new employees, you can focus on the things they look forward to enjoying now that they are on your team - this is one of our powerful communication and team building exercises. 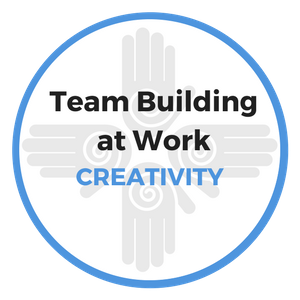 To download our free Team Building At Work eBook for more great communication and team building ideas, simply subscribe to our free newsletter. You will immediately receive a password that grants access to our entire leadership tools library.